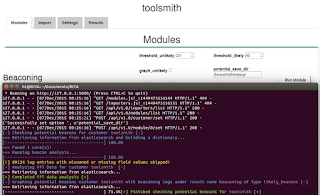 toolsmith #111: Lovely RITA, may I inquire? We benefit this month from another offering first spotted via my fellow tool aficionados over at Toolswatch. And just like that, bam! A Beatles song...stuck in my head...all day.The crazy crew at Blackhills Security have embarked on another cool project: Real Intelligence Threat Analysis, or RITA, thus named because "Johns' mom" was already taken. This is the team who's brought us ADHD (Active Defense Harbinger Distribution and Recon-ng, both prior toolsmith topics. As such, I stalk their site, blog, and Twitter accounts like a tool nerd possessed, waiting for the next set of interesting bits to drop. RITA is very young in its development life cycle, not yet even two months from its initial release as this is written. That does not mean it should not be brought to your immediate attention. On 4 DEC the Black Hills Info Sec team updated RITA's Bro logs import capabilities, her moment had arrived. 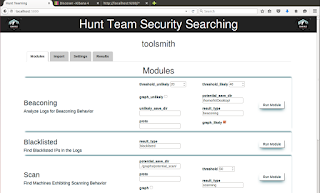 From RITA's readme.md: "RITA is a toolkit which is intended to help approach the often overwhelming task of combing through piles of log data looking for suspect behavior. RITA is intended to help in the search for indicators of compromise in enterprise networks of varying size. The framework was instructed by it's engineers experience in penetration testing with the question of how they'd catch themselves, thus the analysis tends to looks specifically at the indicators their tools tend to leave behind." This is the basis of a contemporary hunting practice, the definition of proper red team / blue team give and take. Emulate your adversary with the same tools they'd use (red), then write and implement detection and alerting logic to identify that same activity. You'll force your red teams to become stealthier while improving your blue team tactics, all the while improving your likelihood of catching average and less sophisticated adversaries. Read all the docs, that's an order, but I'll give you my exact setup steps, which borrow liberally from the docs above...that you're supposed to read. 1) Download and import the RITA OVA. Username: ht, password: !templinpw! (change it). 2) Crack open a terminal and run sudo apt-get update && sudo apt-get upgrade. Good time to take a VM snapshot. 3) Download bro_logs.tar.gz and logstash_script.tar.gz. 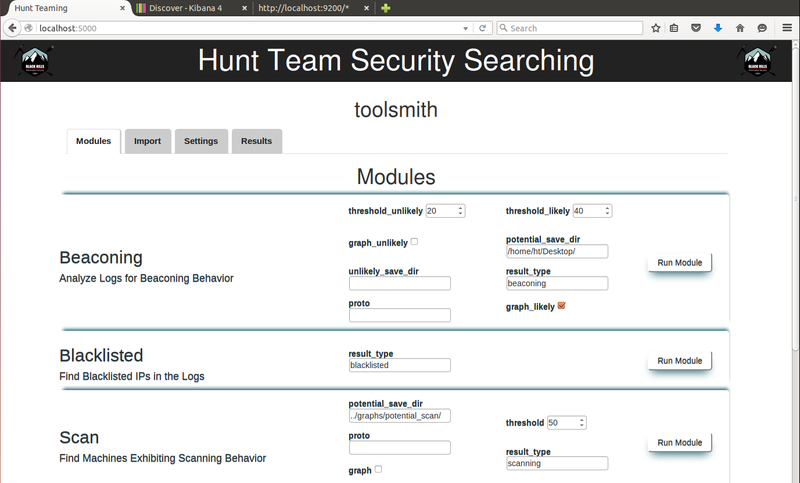 4) Create a logs directory, I used mkdir /home/ht/Documents/toolsmith. 5) Unpack bro_logs.tar.gz in your new directory, it created /home/ht/Documents/toolsmith/logs for me. 6) Unpack logstash_script.tar.gz in the new logs directory. 9) Edit bro.conf (line 128) such that imported Bro logs write to an index of your choosing. 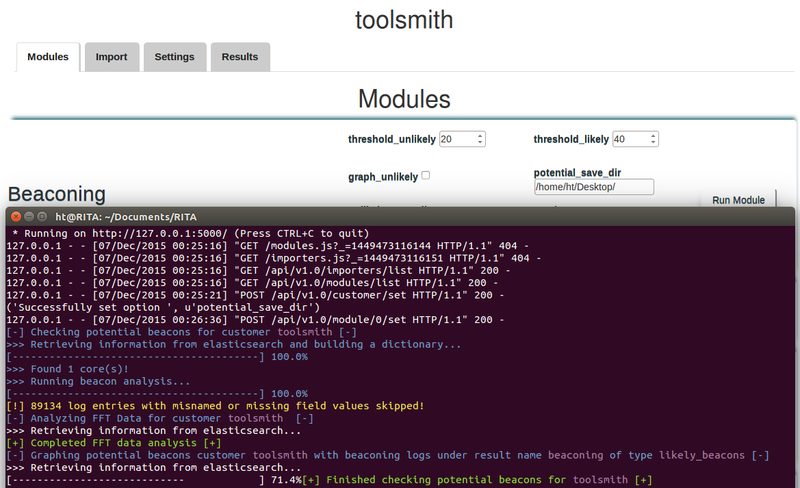 You'll be shocked to learn that I chose toolsmith. 12) Go to Settings tab, change the index name to that which you selected above and add @timestamp under Time-field name resulting in something like Figure 2. 13) Go to Discover, and change time range from Last 15 Minutes to Last 5 Years. If all's gone to plan you'll see 572,687 entries. 14) Back at your terminal, cd Documents/RITA. Under Beaconing, change potential_save_dir to /home/ht/Desktop/ then click Run Module. While you wait, you can watch progress in you terminal window. Again, browse to http://localhost:5601, go to Discover, and change time range from Last 15 Minutes to Last 5 Years. You'll see a slew of results for "unlikely beacons"; this will not do. We need likely beacons, or what's the point? Search result_type:likely_beacons, and dig deeper. A number of the results seek destinations that are multicast addresses, let's filter those out. I tried result_type:likely_beacons -239.255.255.250 and shrunk to load to three hits, two of which shared a destination IP of 107.170.48.146 as seen in Figure 5. You should also see a number of PNG result files in /home/ht/Desktop by the way, which will visually help you confirm, Figure 5 does exactly that. Source IPs 192.168.56.72 and 192.168.0.23 are both communicating with 107.170.48.146 over HTTP. The beaconing is identified via a Fast Fourier Transform algorithm (FFT) generating graph that represents the results based on the time stamps for a given source/destination connection. For continued pursuit of a culprit I then filtered with src:192.168.56.72 AND dst:107.170.48.146 -unlikely_beacons, which resulted in 49,611 hits. Maybe an additional focus area from RITA's list such as Long Durations? Yep, that worked. result_type=long_durations AND src=192.168.56.72 returned 60 hits including 54.192.89.85. That IP belongs to Amazon Web Services, nobody ever uses a cloud node for exfil or C2 during hacks or pentest work, right? :-) A long connection at odd hours bound from one of your source IPs to an AWS node could be quite interesting and worth a closer look. Figure 7: Why is my IP having a long chat with an AWS node? Another interesting pivot may be to see what else your source IP has been up to at this point. I tried result_type=scanning AND src=192.168.56.72 and...what!...a scanning hit? You may notice that the dates are wonky, they represent when I ran the query rather that the date of the actual scanning activity. I re-queried just the destination IP, 67.215.250.139 in this case, and returned correct time stamps: September 16, 2015. Sure, these are sample logs, but as an exercise opportunity, the work beautifully conveying how important it is to analyze from multiple perspectives. 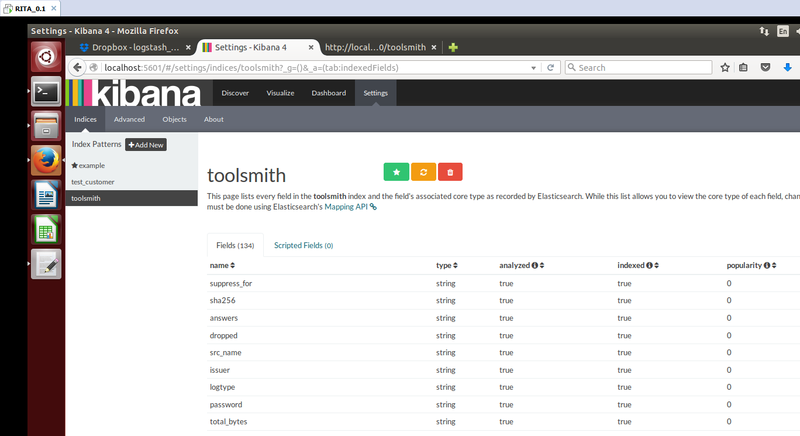 Yes, RITA is work in progress, but if you use it only as an excuse to improve you ELK stack fu, you're already winning. Yes, we all love Splunk, but no we cannot all afford it. RITA and ELK go a long way down the path to free and open source alternatives, particularly for Bro users, which you should all be. Keep an eye on this project, I love where it's going, I'm betting the futures for this one. With some of my new found flexibility (not bound to print deadlines) I'm now able to provide near-realtime toolsmith content in direct response to recommendations or interaction via social media (@holisticinfosec), and other avenues. Just another service provided by your friendly neighborhood toolsmith. :-) Such is the case as we discuss Erik Hjelmvik's CapLoader. We're connecting a few strands in our beautifully enmeshed community here. First, we discussed Erik's outstanding NetworkMiner in November 2011. 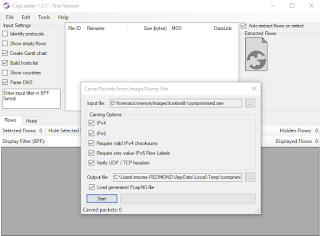 Erik's tools have done nothing but improve since, and CapLoader, as part of those regular improvements, came to fruition to answer the "large file" problem. Second, in May 2015, when I discussed Hunting in-memory adversaries with Rekall and WinPmem I created a fairly sizable memory image (5GB) that included network activity from a compromised host to an attacker-controlled resource. When, via Twitter, I announced that I'm presenting related content to a 2015 Northwest Regional ICAC Conference audience on 5 OCT, Erik replied to remind me that, if I hadn't already, to try and carve packets from my memory dump with CapLoader, and that I'll be amazed. As a jaded, crusty, and exponentially aging security practitioner, I'm not easily amazed, so I took the challenge and told him "I'm going to do u one better. Next #toolsmith to be about CapLoader inspecting the memory image specifically created for this talk." And here we are! 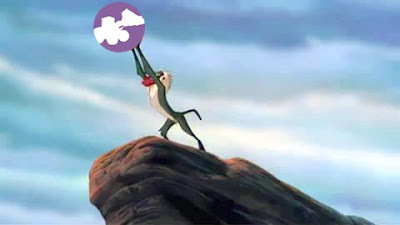 The HolisticInfoSec circle of life. As CapLoader's network carving from memory feature has been available for more than a year, and it was nicely written up for you on the Netresec blog, I'll point you to Erik's March 2014 post as your starting point, along with the above mentioned WinPmem/Rekall article. 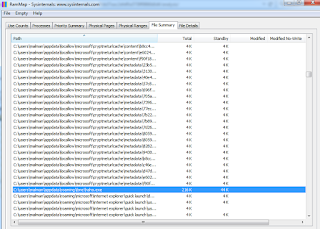 CapLoader is easily downloaded and installed on modern Windows systems, your only dependency is .NET Framework 4.0. 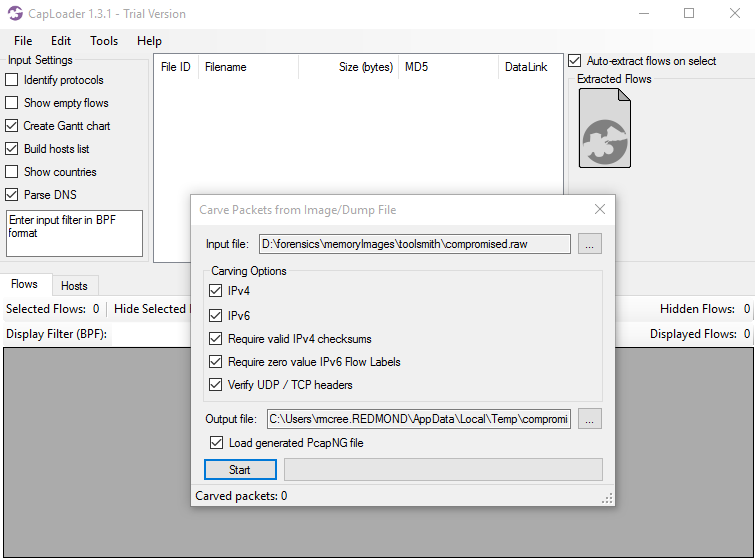 The free version will provide all the network packet carving magic you need, but I also tested the commercial version with a license provided by Erik. I'm going to give you some perfomance benchmarks as well as we go along. Here's how easy it was to put CapLoader 1.3.1 Trial to use on the compromised.raw memory image from the WinPmem/Rekall article. Left all Carving Options enabled and clicked Start as seen in Figure 1. Exactly 76 seconds later, the free, trial version of CapLoader extracted 32 flows from 23 hosts from a 5GB memory image acquired via WinPmem. Sorry, this isn't amazing, it's amazeballs. I can't express how fast that is for functionality of this nature. There, awaiting further analysis, was compromised.raw.pcapng. 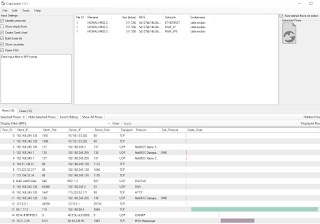 Better still, I wanted to just focus on flows for two hosts, 192.168.177.130 (attacker) and 192.168.177.129 (victim). CapLoader includes an Auto-extract flows on select feature, I just highlighted these two flows, and BLAM!, they were written out to a new PCAPNG file as seen in Figure 2. 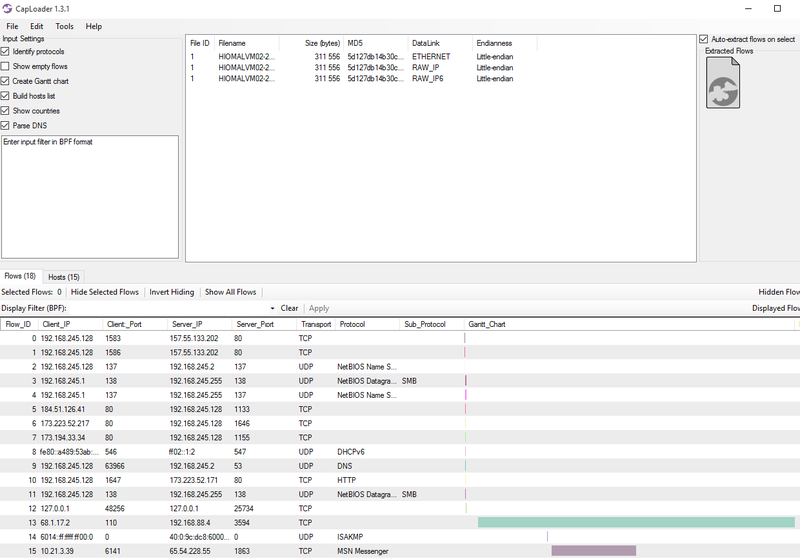 Just double-click the PCAP CapLoader logo in the upper-right quadrant of the CapLoader UI and it'll open the selected flows in Wireshark (if installed) automatically. You can also just click File then Save Selected Flows. In addition to Wireshark analysis, what's the most obvious next step given that we're talking about a Netresec tool here? Yes! Use NetworkMiner. One small note: if you have any issues moving between PCAPNG and PCAP files (the free version of NetworkMiner doesn't open PCAPNG files) you can use PcapNG.com (also a Netresec service) to convert captures smaller than 8MB. I repeated the exercise with the commercial version of CapLoader with two additional features enabled, Identify Protocols and Show Countries, and in 72 seconds (four seconds faster than our first run with the trial version) had my results. After all this though, the resulting network capture was not much use as I had pushed my Meterpreter session for the Rekall discussion over HTTPS, but you get the point. Had network traffic ensued via a clear-text protocol, CapLoader's ability to rapidly carve it out of a memory image would have been invaluable. To prove that point, I'll give you one quick unrelated example. 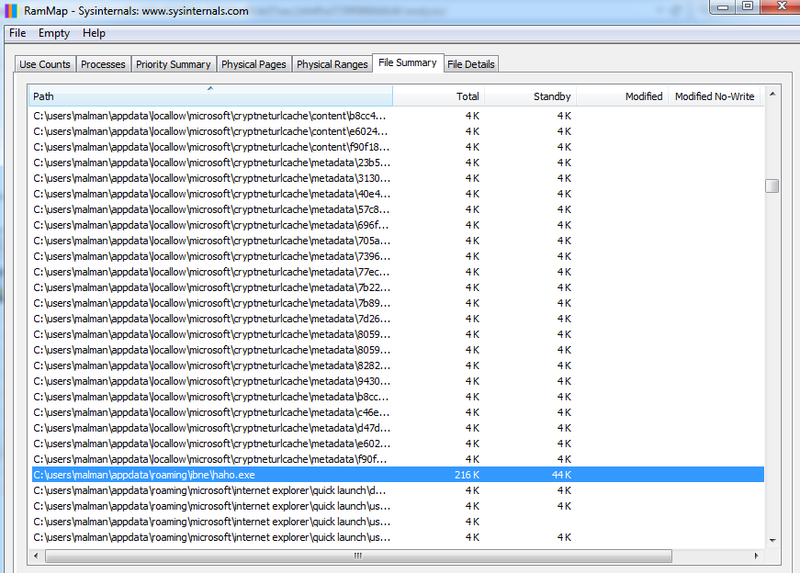 Using the commercial copy of CapLoader, I loaded a different memory image where misuse of MSN Messenger was in play. In exactly 22 seconds for this 1GB memory image, and a bit of column sorting, I was able to instantly visualize the Messeger traffic using the CapLoader Gantt feature as seen in Figure 3. CapLoader is wonderful stuff indeed from Erik and Netresec, loved the suggestion to explore it in the context of the Hunting in-memory adversaries with Rekall and WinPmem presentation, and as always, look forward to what's next from Erik. Follow Erik via @netresec and ping me via email or Twitter if you have questions (russ at holisticinfosec dot org or @holisticinfosec). This month finds us in a new phase for toolsmith as it will not be associated with ISSA or the ISSA Journal any further. Suffice it to say that the ISSA board and management organization decided they no longer wanted to pay the small monthly stipend I’d been receiving since the inception of the toolsmith column. As I am by no means a profiteer, I am also not a charity, so we simply parted ways. All the better I say, as I have been less than satisfied with ISSA as an organization: Ira Winkler and Mary Ann Davidson should serve to define that dissatisfaction. I will say this, however. 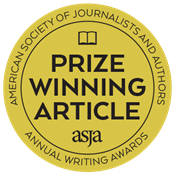 All dissatisfaction aside, it has been my distinct pleasure to write for the ISSA Journal editor, Thom Barrie, who has been a loyal, dedicated, committed, and capable editor and someone I consider a friend. I will miss our monthly banter, I will miss him, and I thank him most sincerely for these nine years as editor. The ISSA Journal is better for his care and attention. Thank you, Thom. Enough said, what’s next? I’ll continue posting toolsmith here while I consider options for a new home or partnership. I may just stick exclusively to my blog and see if there is a sponsor or two who might be interested in helping me carry the toolsmith message. I thought I'd use our new circumstances to test a few different ideas with you over the next few months, your feedback is welcome as always, including ideas regarding what you might like to see us try. As always toolsmith will continue to offers insights on tools useful to the information security practitioner, typically open source and free. 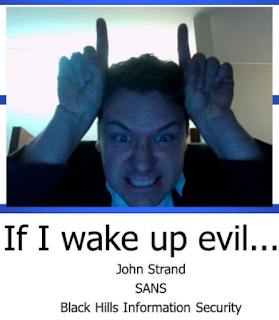 To that end, I thought I'd offer you a bit of R code I recently cranked out for a MOOC I was taking. The following visualizations with R are the result of fulfilling a recent assignment for Coursera’s online Data Visualization class. The assignment was meant to give the opportunity to do non-coordinate data visualization with network data as it lends itself easily to graph visualization. 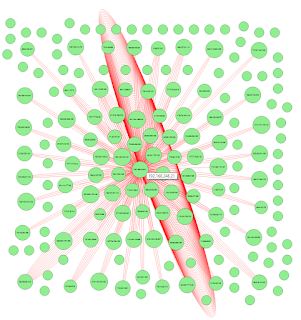 I chose, with a bit of cheekiness in mind, to visualize network data…wait for it…with security-related network data. I gathered data for the assignment from a network traffic packet capture specific to malware called Win32/Sirefef or ZeroAccess that uses stealth to hide its presence on victim systems. This Trojan family runs the gamut of expected behaviors, including downloading and running additional binaries, contacting C2, and disabling system security features. The Microsoft Malware Protection Center reference is here. Where the protocol utilized was HTTP, the resulting packet length was approximately 220 bytes. Where the protocol was TCP other than HTTP, the resulting packet length was approximately 60 bytes. For tidy visualization these approximations are utilized rather than actual packet length. 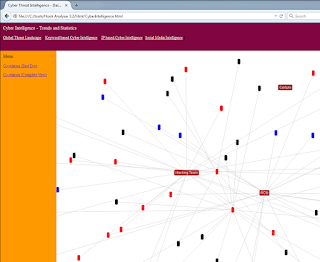 Only some hosts utilized HTTP, specific edges are visualized where appropriate. A summary of the data is available for your review after the Graphviz plots at the end of this document. 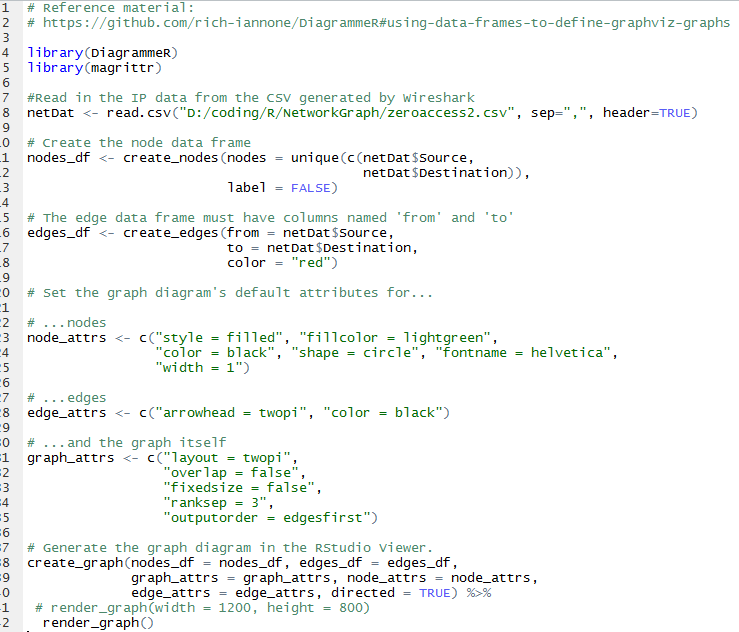 The DiagrammeR package for R includes Graphviz, which, in turn, includes four rendering engines including dot, neato, twopi, and circo. I’ve mentioned Graphviz as part of my discussion of ProcDot and AfterGlow as it is inherent to both projects. 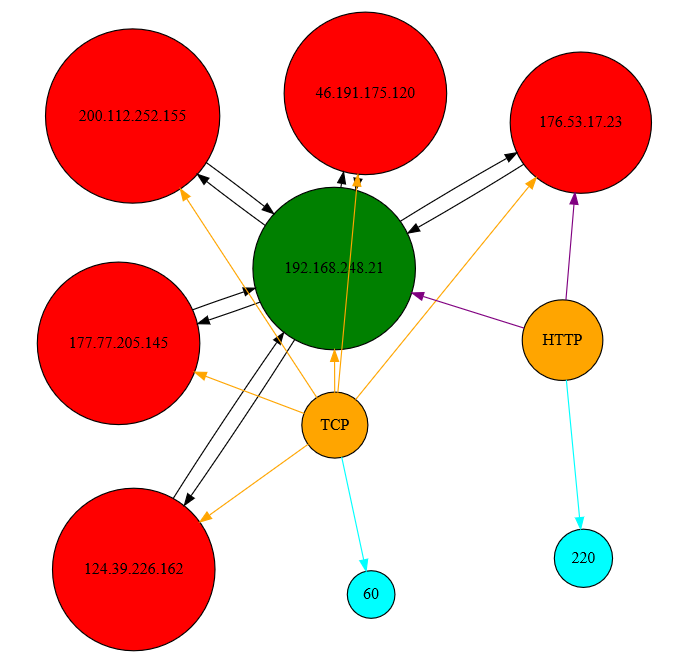 The following plots represent a subset of the ZeroAccess malware network traffic data. - The green node represents the victim system. 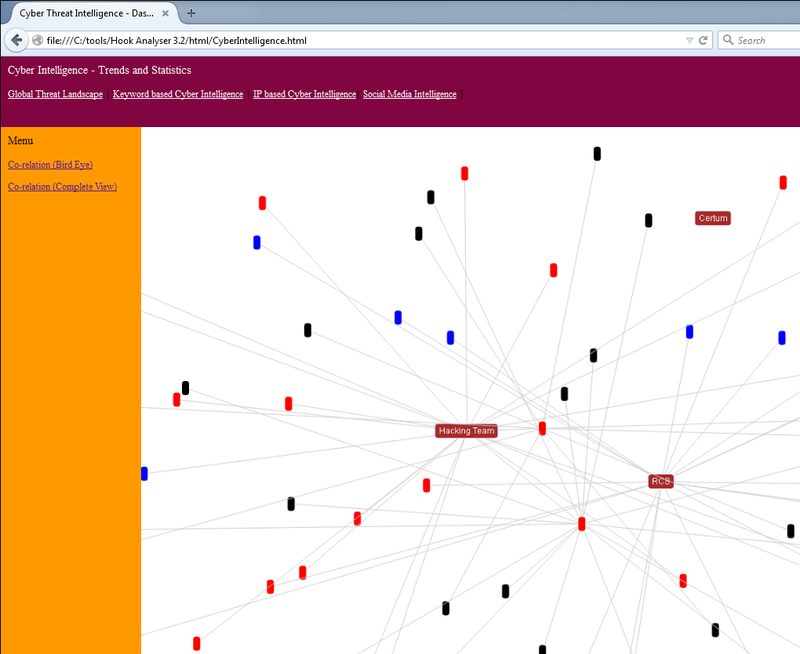 - Red nodes represent the attacker systems. - Orange nodes represent the protocol utilized. 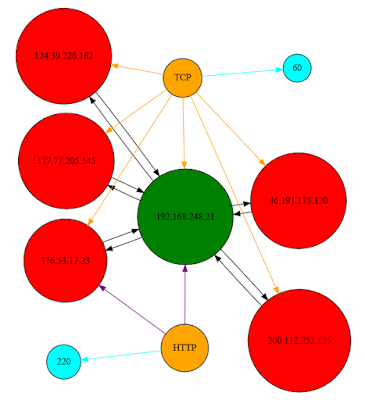 - Black edges represent the network traffic to and from the victim and attackers. - Orange edges represent hosts conversing over TCP protocol other than HTTP. - Cyan edges represent the relationship of protocol to packet length. - Purple edges represent hosts communicating via the HTTP protocol. Graphs are plotted in order of my preference for effective visualization; code for each follows. 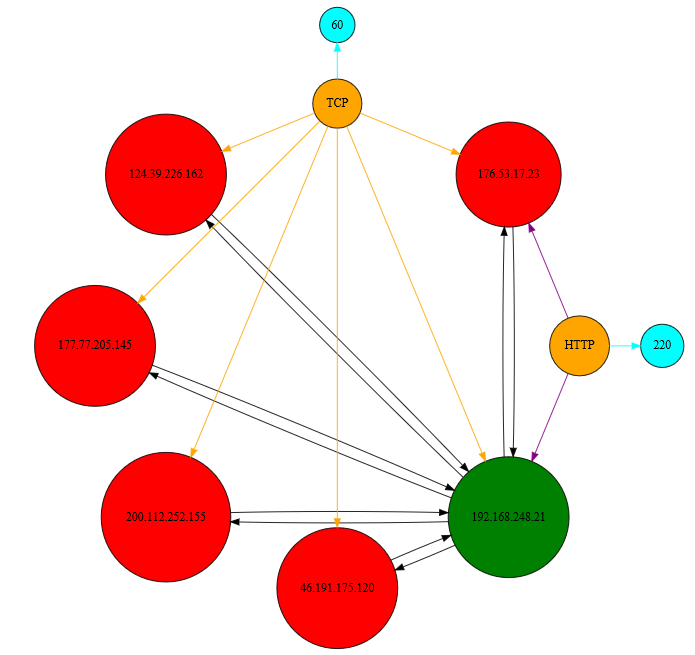 After these first four visualizations, keep reading, I pulled together a way to read in the related CSV and render a network graph automagically. Populating graphs arbitrarily as above as examples is nice...for examples. In the real world, you'd likely just want to read in a CSV derived from a Wireshark capture. As my code is crap at this time, I reduced zeroaccess.csv to just the source and destination columns, I'll incorporate additional data points later. To use this from your own data, reduce CSV columns down to source and destination only. 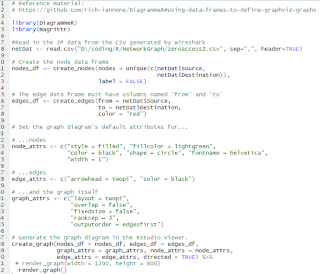 Code first, with comments to explain, derived directly from Rich Iannone's DiagrammerR example for using data frames to define Graphviz graphs. Visualization 5 is your result. As you can see, 192.168.248.21 is the center of attention and obviously our ZeroAccess victim. Yay, visualization! Following is a quick data summary, but you can grab it from Github too. Hopefully this leads you to wanting to explore visualization of security data a bit further, note the reference material in Acknowledgments. I've stuffed all this material on Github for you as well and will keep working on the CSV import version as well. Ping me via email or Twitter if you have questions (russ at holisticinfosec dot org or @holisticinfosec). Cheers…until next month. As we explore privacy in this month’s ISSA Journal, timing couldn’t be better. Since last we convened, the Hacking Team breach has informed us all that privacy literally is for sale. Hacking Team’s primary product is Remote Control System (RCS), “a solution designed to evade encryption by means of an agent directly installed on the device to monitor. 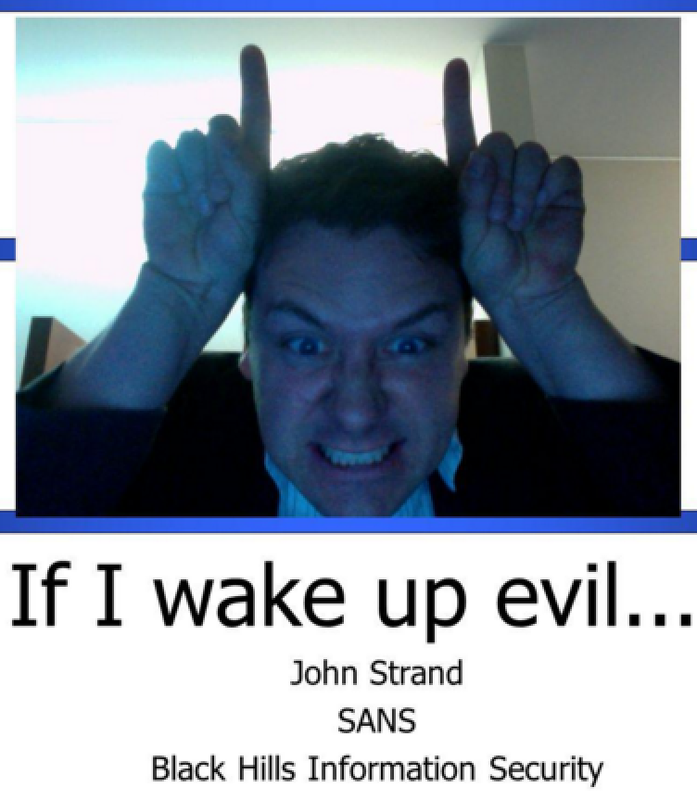 Evidence collection on monitored devices is stealth and transmission of collected data from the device to the RCS server is encrypted and untraceable.” While Hacking Team initially claimed their products are not sold to “governments or to countries blacklisted by the U.S., E.U., U.N., NATO or ASEAN” the data dump made public as result of their breach indicated otherwise. In fact, their customers include major players in finance, energy, and telecommunications. Among all the 0-days and exploits in the Hacking Team dump, it was even discovered that they offered UEFI BIOS rootkit to ensure “that it silently reinstalls its surveillance tool even if the hard drive is wiped clean or replaced.” With industry giants willing to seemingly utilize the likes of RCS, we’re left to wonder where the line will be drawn. I long ago assumed there is no line and therefore assume there is no privacy. May I recommend you join me in this gloomy outlook? Perhaps a little proof may help you come to terms with this simple rule: don’t store or transmit via digital media that what which you don’t want read by anyone and everyone. 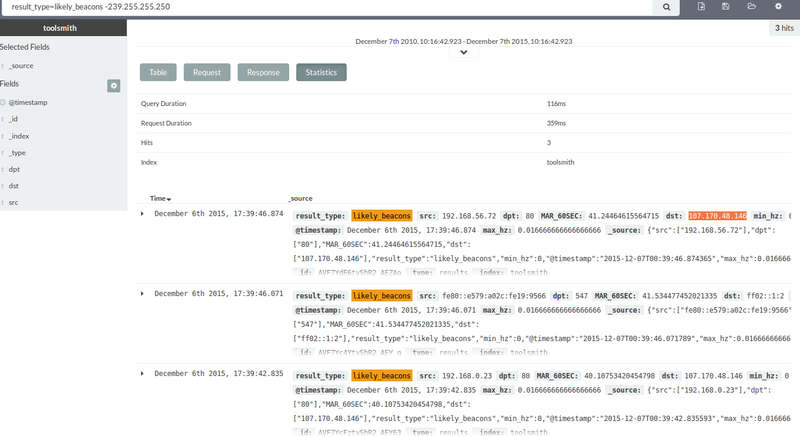 The Cyber Threat Intelligence module provides open source intelligence where you can search for IP addresses, hashes or keywords. It will collect relevant information from various sources, analyze the information to eliminate false-positives, correlate the various datasets, and visualize the results. What better to run Hacking Team binaries through. Let’s begin. 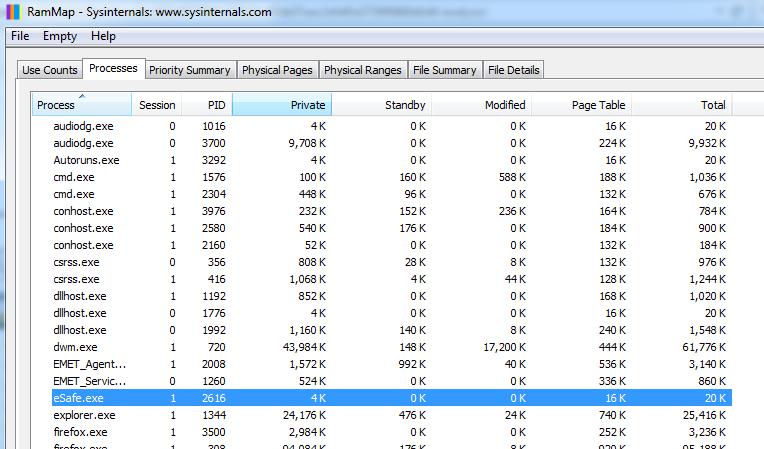 I found it interesting that one of the four (Microsoft Word 2010 2.exe) exhibited no antimalware detection via Virus Total as this was written, so I started there. 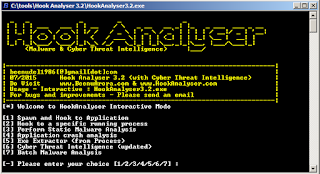 Hook Analyser is stand-alone and runs in console mode on contemporary Windows systems. For this effort I ran it on Windows 7 x32 & x64 virtual machines. The initial UI as seen in Figure 1 is basic and straightforward. For Microsoft Word 2010 2.exe I opted to use Spawn and Hook to Application and provided the full path to the sample. 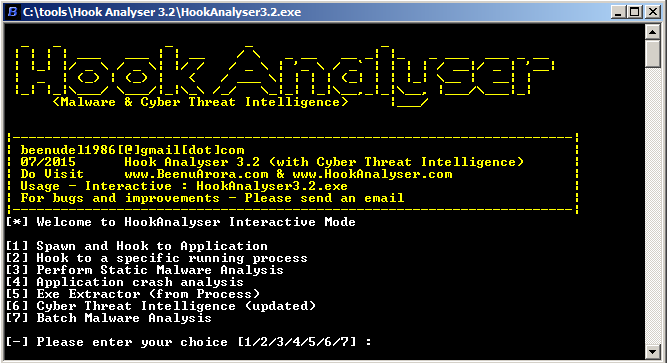 Hook Analyser exited quickly but spawned C:\tools\Hook Analyser 3.2\QR7C8A.exe, with which I repeated the process. The result was a robust output log to a text file named by date and time of the analysis, and an XML report, named identically, of the high-level behaviors of the sample. A few key items jumped right out in the reports. First, the sample is debug aware. Second, it spawns a new process. Third, Hook Analyser found one trace of a potential PDB/Project at offset 00007F0. When I ran strings against the sample I found c:\users\guido\documents\visual studio 2012\Projects\fake_office\Release\fake_office.pdb, confirming the project and even the developer. I’d have to err on the side of threat related in this scenario, just on project name alone. Further analysis by Microsoft’s Malware Protection Center revealed that it checks for the presence of a legitimate instance of winword.exe on C: or D:, then executes C:\a.exe. As a results, this sample has been classified “threat related”. Based on naming conventions followed by Hacking Team, one can reasonably conclude that C:\a.exe is likely an RCS agent. By the way, Guido, in this case, is probably Guido Landi, a former senior Hacking Team software developer. You can see the overall output from both reports in a combined Figure 2. 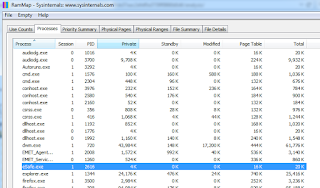 WINHTTP.dll (mapped in memory) with a WinHttpGetIEProxyConfigForCurrentUser call, which provides the Internet Explorer proxy settings for the current active network connection. Remember that privacy you were so interested in maintaining? Let’s say you’re asked to investigate a suspect system, and you have no prior knowledge or IOCs. You do discover a suspicious process running and you’d like to dump it. Choose Exe Extractor (from Process), reply no when it asks if you’d like to dump all processes, then provide the process ID you’d like extracted. It will write an EXE named for the process ID to your Hook Analyser working directory. You can also run batch jobs against a directory of samples by choosing Batch Malware Analysis, then providing the path to the sample set. Each of these is managed by a flat text file as described in Beenu’s recent post. One note, don’t get to extravagant with your keywords. Try to use unique terms that are tightly related to your investigation and avoid using broad terms such as agent in this case. I dropped a Hacking Team-related IP address in the intelligence-ipdb.txt file, the keywords Certum, Unizeto, Hacking Team, and RCS in keywords.txt, and Hacking Team in channels.txt. Tune these files to your liking and current relevance. As an example URL.txt has some extremely dated resources from which it pulls IP information, there’s no reason to waste cycles on all of the default list. I ran the Threat Intelligence module as a standalone feature as follows: ThreatIntel.exe -auto. Give it a bit of time, it checks against all the provided sources and against Twitter as well. Once complete it will pop a view open in your default browser. 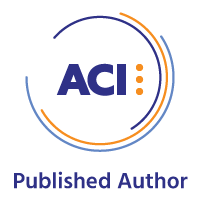 You’ll note general information under Global Threat Landscape including suspicious IPs and ASNs, recent vulnerability data, as well as country and geo-specific threat visualizations. More interesting and related to your investigation will be the likes of Keyword based Cyber Intelligence. The resulting Co-relation (Bird Eye) view is pretty cool, as seen in Figure 3. Drill into the complete view for full keyword content results. I updated channels.txt to include only hackingteam and intelligence-ipdb.txt with related Hacking Team IP addresses. While I was unable to retrieve viable results for IP intelligence, the partial results under Social Intelligence (Recent Tweets) were relevant and timely as seen in Figure 4. There are a few bugs that remain in the Threat Intelligence module, but it definitely does show promise, I’m sure they’ll be worked out in later releases. 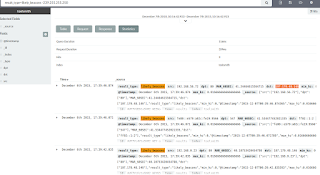 The updates to the Threat Intelligence module are reasonable, potentially making for a useful aggregation of data related to your investigation, gleaned from your indicators and analysis. Couple that with good run-time and static analysis of malicious binaries and you have quite a combination for your arsenal. Use it in good health, to you and your network!